The Café intermezzo, Rita Mae Brown at Evergreen as the Vietnam War ended, Lily Tomlin in Olympia for the 1984 Olympics Women’s Marathon Trials, the 1976 Women’s Music Festival in Olympia produced by Tides of Change, The Janes of All Trades, and much more … local history to revel in! 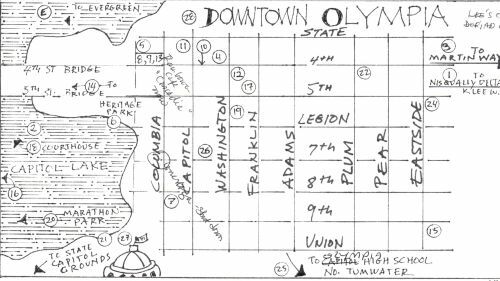 Share the celebration of this neglected piece of Olympia’s history on the project’s Facebook Page. 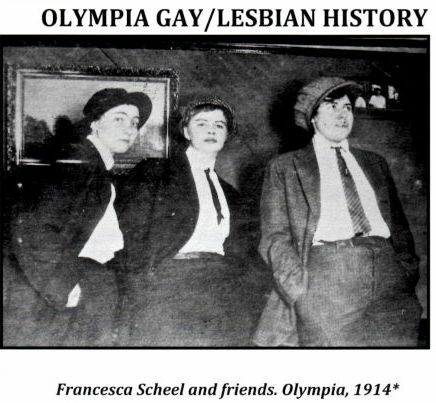 See the broadside they’ve produced: Historic Highlights of Olympia Lesbian Gay History. (Llyn is an anthropologist and author; some of her other work is here. And a bit from Carol, who is a Unitarian minister, here.) Thanks Llyn and Carol and SAGE! This entry was posted by Guest Voice on March 17, 2013 at 10:05 am, and is filed under Events, People of Hypatia. Follow any responses to this post through RSS 2.0.Both comments and pings are currently closed.